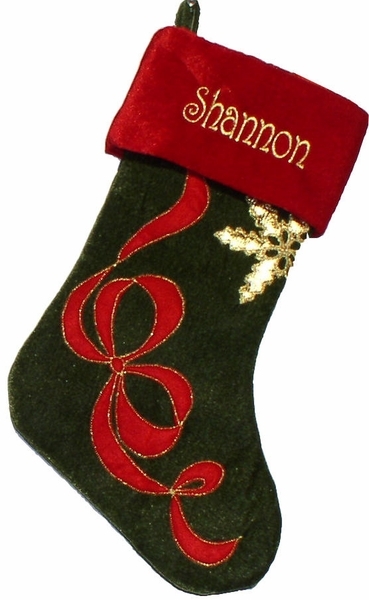 Personalized Christmas stocking in olive green boot and deep Christmas red color velvet ribbon and snowflake applique. The velvet red cuff looks best personalized in gold embroidery thread. Names can be personalized on the red cuff of this Christmas stocking with Gold metallic embroidery thread to compliment the stocking design and color scheme. Lining: Yes, this Christmas stocking is lined inside with fine satin material that matches the color of the stocking.